Our youngest performers (Ballet 3) often get their first performing experience in children’s ballets. Inspired by the Ludwig Bemelmans books. One of the oldest ballets still regularly performed, La Fille Mal Gardee was the archetype of the happy peasant ballet. In this children’s version of Act 1, Lise does her chores and joins her friends for a maypole dance – until a storm interrupts! A magical interlude features ladybugs, butterflies, bees and other nimble creatures. A ballet reverie centers on a very young Mozart. Jerome Robbins used this music for his ballet Fanfare, and Yvonne Mounsey, our director, created the role of The Harp. Caprice Walker choreographed this charming version as her salute to Yvonne. Each dancer is an instrument, with the sections of the orchestra color-coordinated. 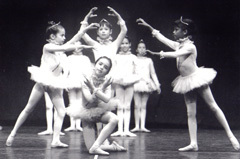 The photo above shows the oboes in the 1995 production.